Far from the traditional bracelet with colourless diamonds or even coloured diamonds, black diamond bracelets are very distinctive. It is not an ordinary choice. As fascinating as it is rare, this black gemstone gives a secret aspect to your wrist jewellery. When it is given as a sign of love, it carries deep meaning. Its mysterious characteristic is like a call to discover, travel and love. Isn’t love itself mysterious? It is indeed true that there is little agreement on a clear definition of this feeling. Each individual has his or her own interpretation. 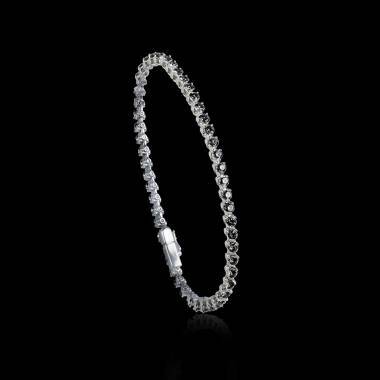 A black diamond bracelet is thus very unique and its colour bestows unparalleled elegance upon the bracelet. A diamond is a diamond. These magnificent precious gemstones are extremely hard. Diamonds are forever. That’s why jewellery with diamonds can symbolize pure, unique and indestructible love. It is even more the case when it’s a black diamond bracelet. As it is discrete, elegant and unique, it adds grace to the woman who wears it. It is important to note that a black diamond is as resistant and bears the same intrinsic characteristics as any diamond. In addition, its chromatic particularity gives it even more charm. Learn more about this unique gemstone in our “Buying black diamonds” page. The colour of your diamond significantly contributes to the beauty of your piece of jewellery. That’s why Maison Jaubalet advises you to choose less elaborate designs for your custom-designed black diamond bracelet. Consider enhancing it by combining other colour materials with the black diamond. The contrast will make it more expressive. If you fall in love with the models on our digital platform, you can order them directly online or customize them.